STEP 2: After your Baby Jesus printable has been printed, trace the lines over the star and the baby with black Sharpie. It is important to make the lines thick enough to cover the already blurred lines. STEP 3: Cut the baby and the star out after you've gone over them really good with black Sharpie. STEP 4: Color Baby Jesus and the star of Bethlehem. STEP 5: Take your brown paper bag. Don't open it yet, just leave it closed. Cut in an oval shape a little bit above half of the bag. Make sure not to cut into the bottom of the bag. This is where will will put the "hay" for Jesus to lay in. You will probably need to hold the bottom flap of the bag out of the way since we have left the bag closed. 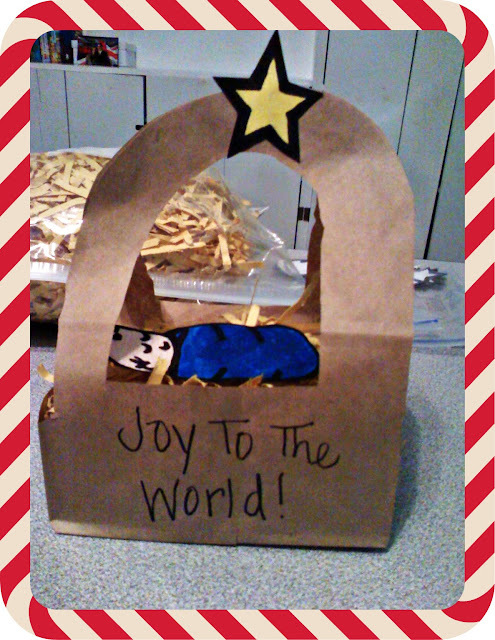 STEP 7: Write 'Joy To The World' on your nice, cut-out bag that now looks like a basket. STEP 9: Glue just the top part of the handles so that they are glued closed. Hold it there for a couple of seconds. Then, glue the star of Bethlehem over it. You could also just staple the top part closed if you'd like. It's a lot easier that way. Don't glue all the way around the handles, just the top part of them. 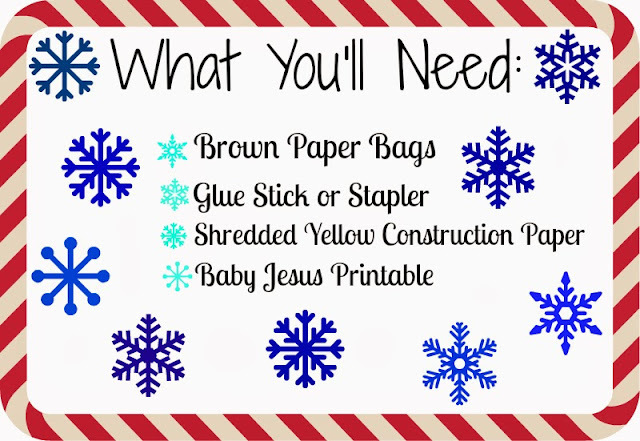 STEP 10: Now, all you have to do is lay your Baby Jesus on top of the shredded paper! You just lay Him on top. There's no glue involved. I hope that tutorial was easy enough for you to follow. It was kind of hard explaining it without pictures. I'm a very visual person, so it always helps me to have pictures to go by. If you had trouble following along, I apologize. I know how ya feel! :) All of the kids really enjoyed this craft. The cool thing about it is that it's simple to make. Of course I pre-cut the stars and babies and cut the "baskets" and shredded the paper. You obviously wouldn't let little kids do those things. They got to color the baby, star, glue the top and fill the basket with "hay."